A huge congratulations to Patti Fawcett of Bendigo South East College who today (Friday 29 March) took out the 24th Class Clowns National Grand Final at The Forum! Patti walks away with a prize of $1500, a $1000 workshop package for their school, plus the Class Clowns trophy. This year’s runners up honours were awarded to: Whose My Parents? (Ben Depoma, Cyrus James-Hankin, Soren Pryor) from St Theresa’s Catholic College QLD, and Nic Doring from Alexandria Park Community High School NSW. 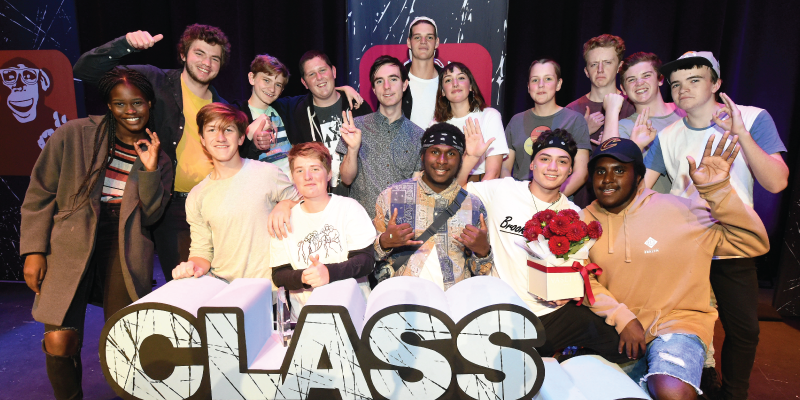 A massive shout out and congratulations to the other ten Class Clown finalists for making it through to the final stage of the competition: Samuel Allison (WA), Luke DeBuhr (VIC), Ethan Gallagher (VIC), Madi Garcia-McShane (TAS), Billie Hoban (VIC), Tyler Howie (VIC), Keaton Jones (QLD), Isaac Loom (ACT), Rerose Roro (VIC), Jack Soden (SA) and JD Talty (NSW). This awesome event was hosted by Nikki Britton, with special guests performances by Ivan Aristeguieta and Karen from Finance. On the judging panel were Catherine Andrews, Nazeem Hussain, Nathan Lloyd and Steph Tisdell.